A full body scanner is used to reveal objects, including weapons and explosives that could be concealed under clothing. The technology is safe and effective. It provides you with a choice between full body scanning and a physical search if you are selected for additional screening. The screening officer sees an image that has no identifying features, and largely resembles a generic “stick” figure instead of a skeleton-type image. Because the new images are generic and are immediately and permanently deleted after they are viewed, there are no longer privacy concerns. 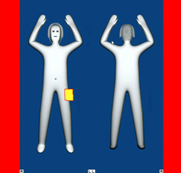 If the full body scanner reveals an item under your clothing, the area of concern will be highlighted on the image as seen on the image on the right. CATSA consulted with the Office of the Privacy Commissioner of Canada (OPC) throughout the development of this program. For more information, contact priv@catsa.gc.ca. The scanner works by projecting low-level radio frequency (RF) energy over and around the passenger’s body. Health Canada’s research concludes that the energy emitted by the scanner is within Canada’s RF exposure guidelines and does not pose a risk to health and safety in single or repeated exposures. As the energy used is non-invasive, it is safe for pregnant women as well as passengers with pacemakers or surgical metal implants (i.e. plates, screws). To be scanned, you must be able to walk through the scanner unassisted and lift your arms fully above your head. If you have a medical condition that may require special attention during the screening process or are unable to lift your arms above your head, we encourage you to let the screening officer know before the screening process begins. Everything from your pockets and any items you are carrying in your hands (including wallet and passport). When you enter the scanner, stand with your feet apart and arms extended over your head. Your fingertips cannot touch each other and you cannot hold any belongings in your hands. The scan takes about five seconds. When the process is complete, exit at the opposite side of the scanner to await further instruction from a screening officer. If you set off an alarm, you will have the opportunity to remove any objects in the area(s) of concern and be rescanned. However, if the alarm cannot be resolved, a physical search will be conducted.